Studebaker Avanti serial number R1007 was labeled number "9" and "R3 powered" for the track at the Bonneville salt flats. Original California registration was to Paxton Products. Supplemental instrumentation and custom tires and wheels were added. R1007 was one of three cars that were used by Studebaker for the speed record trials at Bonneville in 1962-1963. The Gold Avanti labeled number “9” was driven by Andy Granatelli and scored an American Class C closed car supercharged record speed of 170.81 miles per hour. In this same automobile, Paula Murphy was to became the “Worlds Fastest Woman on Wheels.” The prototype test car was a darker non-production red. 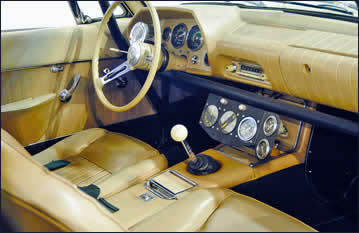 The prototype became the test car in 1962 and the backup was the gold car. The prototype was later modified into the Due Cento for the 1963 Bonneville runs. The third car (R1014) was red and was labeled number "8" for the 1963 runs. The gold car labeled number "9" set the records in 1963 and the red car labeled number "8" became the backup. R1007 has been on temporary exhibit at the Studebaker National Museum and the California Auto Museum. The world's fastest production car for 1963, Studebaker Avanti R1007. 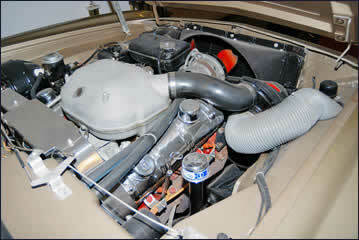 The car is fitted with a full roll cage, extra instrumentation and its original Bonneville wheels and tires. 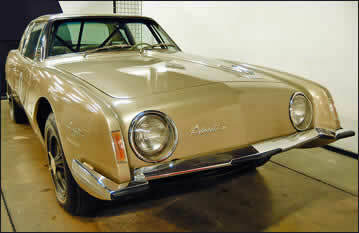 Studebaker Avanti R1007 front view. 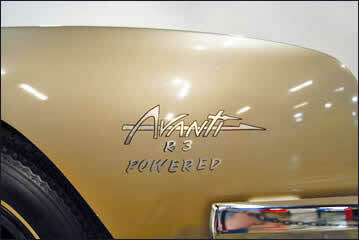 "Avanti R3 Powered" label on the front fender.